Gamla stan (The Old Town) is the old town of Stockholm, Sweden. 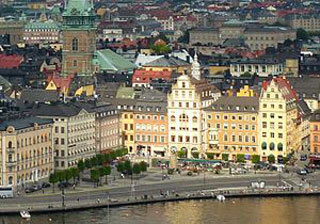 Gamla stan consists primarily of the island Stadsholmen. The town dates back to the 13th century, and consists of medieval alleyways, cobbled streets, and archaic architecture. North German architecture has had a strong influence in the Old Town's construction. This article uses material from the Wikipedia article "Gamla stan", which is released under the Creative Commons Attribution-Share-Alike 3.0 License.